Chapter 17 is the final prayer of Jesus. It was the custom in those days to record a final prayer like this of notable people and John followed that practice, presumably gathering the recollections of the disciples of what Jesus actually said – they often prayed aloud in those days. Jesus begins by praying for himself, saying “Father, the hour has come. Glorify your Son, that your Son may glorify you.”What a strange thing to say! He was expecting to die the next day the most excruciating and demeaning of deaths by crucifixion. We think of glory as receiving praise and honour, even adoration and worship. Jesus was asking God the Father to glorify him that rather different way. How amazing! What could he possibly have been thinking? The way he worded his request it certainly refers to that terrible next day. A very few verses later he does say, “now, Father, glorify me in your presence with the glory I had with you before the world began” and there he is looking forward to when he returns to heaven and sits down at the right hand of the Father, receiving the honour and glory of that position. But not here – here he sees glory in what was about to happen in his death in the next 24 hours and then 3 days later in his resurrection. Jesus was taking the long view, which in view of the torture he knew he was about to have to endure is quite amazing. He knew, as the disciples didn’t, that his tomorrow, his hour as he called it, was going to be the most glorious day in the history of the world. He, God, was about to die for the salvation of mankind. His tomorrow would be the dividing point of history. Up to that day nobody had had anything more than hope that the Lord God would accept them. From that tomorrow onwards those who turned to him in humility and faith would begin to understand that they would be accepted in his name, on the basis of his sacrificial work on the Cross. Then a few days later they would learn that they had the Holy Spirit of God, his replacement, actively involved in their lives, directing their course through life, supporting them in all the many problems that the human condition brings, challenging and empowering them. So there was glory ahead, even if it looked a rather strange glory at first sight. Indeed, it was because the followers he left behind recognized that glory that they started to worship him and it was because they found themselves irresistibly worshipping him that they began to realise that he was no less than God walking this earth as well as being a man. That was his matchless glory. This is his matchless glory for us. We only need a small bit of that glory to come into our lives, to illuminate us, to be deeply blessed. Thank you, Lord Jesus, for your prayer, for your constancy, your endurance of all the physical pain and spiritual pain that lay so closely ahead of you as you prayed. Thank you that your glory was for us. I think we should pause for a moment to think of what all this must have looked like to the disciples. It is no surprise that they said to each other, “We don’t understand what he is saying.” About three years earlier they had agreed to join the new group forming around the person of Jesus. They thought he was a prophet and, very probably, the leader who would set up a rebellion against the hated Roman occupation, which might just succeed. It had been a considerable surprise to find that things were working out very differently from those early expectations. They had been flexible enough minded to cope with the change of orientation, probably because they had been carefully selected by Jesus as those who would be flexible in their thinking. They had learned over the three years they had been with him that when Jesus said something would happen – it happened. Now he was saying that he was going away. He had even said he would be killed by the Roman authorities. In view of what was happening in Jerusalem, the seething unrest, it seemed likely that would happen very soon. What then? Would their small group continue? And, if so, who would lead it? Peter had been the obvious spokesperson of the group but would he be capable of leading them forward as a spiritual force? It seemed doubtful. John was stronger spiritually but he was surely too young. James and John were labelled the sons of Boanerges, that is sons of thunder, and they were certainly two forceful characters but were they at all likely to be able to lead an effective group along the lines that Jesus had set up – lines that were so different from their previous experience and, indeed, all that had gone before. Into this difficult and worrying situation Jesus seemed to be suggesting there would come nothing more obvious than a spiritual force which he labelled the Advocate, the Counsellor, the Comforter or, in the original Greek, the Paraclete (meaning a bit of all three). Really. Would that be sufficient? How would in work out in practice? Impossible to imagine. Of course, it did work out because the person being talked about was the Holy Spirit himself. Part of the Triune God, though to say that is to jump ahead several years and even centuries. But their considerable immediate problem was to work out what would he actually do? That we find Jesus told them in 16: 13 – 15, “when he, the Spirit of truth comes he will guide you into all the truth. He will not speak on his own; he will speak only what he hears, and he will tell you what is yet to come. He will glorify me because it is from me that he will receive what he will make known to you. All that belongs to the Father is mine. That is why I said the Spirit will receive from me what he will make known to you.” All of which reinforced what he had already said in 14: 26, “the Advocate, the Holy Spirit, whom the Father will send in my name, will teach you all things and will remind you of everything I have said to you.” So we ought to add ‘teacher’ to the list of words translating ‘paraclete’. Teaching is not an easy occupation. Some teachers will concentrate not on their students but on their material. At their worst they read out their notes expecting their students to copy them down word for word. That is poor teaching particularly in this age of many copying machines. The good alternative is to teach students how to think, so that what they learn will be of use to them even when they do not meet the exact situations the teacher envisaged, and that is not so easy for the teacher. But it is the sort of teaching the Holy Spirit expects us to transmit to others. It is called ‘discipling’! We tend to think of the Holy Spirit as the one who brings specific gifts to individuals: one to this guy, a different one to that girl and so on. But what Jesus is emphasising here, and John is making sure we see, is that the Spirit will be a teacher and a guide for the whole group. That meant the eleven apostles on this occasion, possibly a few more who were also present, and then the ongoing church down through the ages to the present day. Yes, to your church and to mine, imperfect though they may be. This guidance will come as we study the words of Jesus as enshrined in these four Gospels. So much of what we most probably hear and are taught in church actually does not come directly from Jesus but at second hand through the epistles and other scriptures. What Jesus is saying here is a potent reminder of the central importance of his ministry, his life, his death, his stories, his statements. Of course we all know that the difficulties lie in knowing what exactly we should do to obey him - you think that, I think this. Being human we have the very human problem of working out how to hear the leading of the Spirit. Some churches do it through a strong central decision structure; others through a decentralised arrangement of church meetings and executive committees called elderships or diaconates. It is clear from the epistles that both sorts of approach to the problem were used from the very early days of the church and are recorded in scripture, so there is no clear right and wrong here. We have to fit our approach to our particular society and culture. Being human we will often have a tendency to want to retain structures which worked years previously but are not so good in our present day. We live in an age when all societies and cultures are changing continuously and often with a rapidity greater than ever before so that is not a good idea. Let us all, you and I, be careful that we contribute positively to the fellowship we are in, good at hearing the promptings of the Holy Spirit of God, good at not hindering his work, good teachers of the Word of Truth, good at helping the church of the ages to progress towards that great day when He, Jesus, returns to say ‘well done good and faithful servant’. Jesus selected his closest disciples from those who had ‘been with him from the beginning’. They, with the all important help of the Holy Spirit, will be those who are to tell the world what has happened and would shortly lead the infant church on its first steps. There is a fundamental and important difference here between what we, in the Western world anyway, would do and what they did. We think it is important that our witnesses to an important event should be dispassionate, uninvolved observers able to provide an unbiased assessment of what is going on. That was not what they looked for in their recorders of events. They, Jewish and Roman alike, wanted their reporters to be those who had been deeply involved in the events recorded. That was probably because they considered the meaning of the events more important than the actual events themselves and wanted a guide to that meaning such as we would resist. Thus, the prime historian of the Roman-Jewish war of AD 68-71, basically the only one we have access to, was a man called Josephus who was first a commander of Jewish forces involved in the war and then an assistant to the Roman general. He was not unbiased but he had seen what was going on first hand. It is easy to see the point of the way they thought in those days and we must accept its value and not criticise it. We can see these ideas worked out in the four Gospel-writers. Not one of these four names himself within his writing. They took to heart the modesty and humility that Jesus asked of his followers. We only know who they were from reports from the early church. We cannot be absolutely certain of the accuracy of these but there is no good reason to doubt them. Matthew, also known as Levi, was with Jesus from very near the beginning of his ministry (Mark 2: 13,14). We are told that Mark wrote at the direction of Peter, so his Gospel is Peter’s testimony to the events of the ministry of Jesus that he had observed from close to all the way through. Luke, very aware that he was not an eyewitness himself, emphasises in the first few verses of his Gospel (1: 1 - 4) that he had been very careful to refer to eyewitnesses of the events and had checked what they told him very thoroughly. John was clearly an eyewitness although exactly who he was, which John, is a matter of much argument and disagreement. He was the ‘beloved disciple’ of John 13:23 etc. but we don’t know who that was either. John was a very common name in those days. He is usually taken to be John, son of Zebedee, but he was a Galilean fisherman while the writer of the fourth Gospel seems more likely to have been a sophisticated man from Jerusalem. But he certainly was an eyewitness of at least much of the life of Jesus. The result is that we have four accounts of the life of Jesus, which the very early leaders of the Christian church wisely refused to have combined into one, leaving them as true eyewitness accounts of what happened. No event of ancient history is anything like as well documented as the life of Jesus. We can rely on its truth and accuracy even where it seems to defy all natural possibilities, as in the resurrection. To believe in Jesus and all the events of his life is not one step down from knowledge, as many would say. We believe because we know. We cannot testify because we are not eyewitnesses in a literal visible sense. We can testify because of our experiences of the Spirit and his work in our lives. Go! Testify! In stark and obviously intentional contrast to the last section on love Jesus goes on to speak about hate. While love is to be the ruling principle of the followers-of-Jesus, hate is unfortunately a major part of the world’s reaction to those people. Open and direct hostility will be the experience of at least some of my hearers and readers. For many more the hostility will be much less obvious but nearly as potent. I refer to the sort of hidden hostility that is part of much modern Western culture which prides itself on being ‘liberal’ and secular and therefore puts all religions into one category, all regarded as backward and naive. It leads to much of the present tensions about refugees and immigration in Europe. Hidden behind many of the statements against, or for, the influx are attitudes to Islam and the centuries long Christian background of many of the European countries - but no one dares say so! Why is there so much antagonism, or to use the shorter more direct word that Jesus used, ‘hate’, against Christian faith and people. Much of the reason is found in the next chapter at 16: 8 – 11, where we read, “When he [,the Holy Spirit,] comes, he will prove the world to be in the wrong about sin and righteousness and judgment: about sin, because people do not believe in me; about righteousness, because I am going to the Father, where you can see me no longer; and about judgment, because the prince of this world now stands condemned.” Jesus blames the attitudes onto reactions to the actions of the Holy Spirit but, of course, in practical terms those actions are seen as coming from those who present the work of the Spirit to the outside world. We should be showing the world that it is wrong about sin because we are living, if not perfectly pure, lives at least some that are visibly and obviously better than those around us. We may not display perfect righteousness but at the very least we are visibly much closer to acceptance by the Lord than others. Our presence and living practices hold before all others the fact that there is more than one way of living and therefore there is the strong possibility of a judgement still to come. The ordinary non-Christian does not like being shown up in those ways. We tend to see the situation from inside our own cocoons and miss the implications for those outside. Is it any wonder that we are not always all that popular? One of the most puzzling things Jesus said is ‘whatever you ask the Father will give you’. John records this here and Matthew says much the same in his 7: 7. It sounds like a very good idea. The trouble is that we all know it doesn’t always, or even usually, work! There are lots of things I would love to have but I know full well that asking the Lord for them is going to achieve nothing except frustration. But this is the word of the Lord - how can this be. If you have your Bible open as you hear or read this (as you should have!) you will realise that I have cheated by leaving out of what Jesus said the three word phrase which heads this section: ‘in my name’. But before we try to work out the implications of having that phrase in the full statement of 15: 16 let’s think negatively for a moment about some of the ways people try to dodge around the clear implications of the discrepancy between what Jesus said and what our practical experience is. Probably one of the most common is the thought – ‘I don’t have enough faith’. Oh, really. Since when has our faith been measured to see what we deserve? To think that way would be a backwards step to a faith of works. If our faith was measured like that how many of us would ever have received the greatest gift of all which is our salvation, the Holy Spirit, and a place amongst those who have set out to follow Jesus? None of us. Then there are those people who happily call white black and black white. They are quite capable of closing their eyes to what has actually happened and announcing that what they want has happened leaving everybody else scratching their heads and puzzled by their naivety. All sorts of half true phrases are used to cover the situation: the Lord has his own timing - which is different from ours; the answer is wait (implying that if we have to wait long enough we shall have forgotten what we asked for anyway); we get answers to all our prayers but they may not be the answers we wanted. Or we can slide over these verses as if they were not there since we cannot make direct honest sense of them (even some of the best commentators can do that sometimes); and so on. Enough of the negatives - what can we say positively about these statements? The phrase ‘in the name’ is all important. In the culture of those days one’s name was not just a label by which people identified you (this is probably still true in some of the cultures from which you, my hearers and readers, come.) That is the way it was then. That meant therefore that to say something in the name of Jesus meant that the identification of the speaker with Jesus was so tight, so close, that he was speaking as Jesus would have spoken in the same situation. Since Father God would have reacted directly and positively to the requests of Jesus so he would to the one making the sort of request Jesus is talking about. May the good Lord give us all wisdom in our thoughts and actions so that they are well pleasing to him all the time. Now ‘Love’ is a very tricky word! Very obviously ‘love’ in this passage and in the New Testament generally is not quite the same thing as ‘love’ as it is in everyday life. Famously, the Greeks had several words for ‘love’ where we have only one. A great many sermons have been preached on the different words for ‘love’ Jesus used in the discussion he had with Peter in the last chapter of this gospel but it is now widely thought that there is no real difference in the meaning between those words. There are 3 phases to a love between two people; there may be some overlap between them. The first phase is almost always emotional. It may be ‘love at first sight’ between 2 people or the love of a mother for her new-born baby. The second phase is hard to describe with a single word – we will make do with developmental. These are the days or months or years after the initial surge of love feeling in which the relationship develops as the two parts of it slowly get to know each other and grow together. Unfortunately much modern Western thinking discourages people from allowing this phase to develop, wrongly thinking that people can continue to live and love on the sole basis of the emotional phase. The third phase is one of action when on the basis of the thinking of the development stage the potential lovers: man and woman, two of a kind, parent and child grow steadily closer, working out who does what in supporting the relationship. This alone will lead to the true deep and lasting love that we all crave. So in our human relationships to which we attach the label ‘love’ we have emotional, developmental and action phases. What happens when we try to describe Biblical love in these terms, as we must, knowing no others? Biblical love is about either the love of God for a human being or beings or the love of a human for God. Consider the first of those – we know that God loves humans because he tells us so in John 3: 16, “ for God so loved the world” where the context clearly indicates he is talking about not only the totality of humans but the individual human so that the one who believes in Jesus is saved and the one who does not is condemned. But there is absolutely no equivalent to the first phase of the human love sequence. God even tells us he does not love for any emotional reason in Deuteronomy 7: 7, 8 where he says, “The Lord did not set his affection on you and choose you because you were more numerous than other peoples, for you were the fewest of all peoples. But it was because the Lord loved you and kept the oath he swore to your ancestors that he brought you out with a mighty hand and redeemed you from the land of slavery, from the power of Pharaoh king of Egypt.” There was nothing remotely like emotion involved. The love came first, purely out of the hidden purposes of Almighty God. From then on the other two phases, of development and action, are interwoven. God taught his ancient people through his actions. He, so to speak, developed himself step by step. It was never his fault that his people proved to be very slow and poor scholars. Then we come to the second type of Biblical love in which we are to love God. That is tough to do and cannot start with the emotions. Some people: hermits, recluses, monks, spiritual guides; try to make it do so by their adoration of Jesus. Whether they are very successful very often is extremely doubtful. We, ordinary mortals, need to take the longer, harder but surer route, working steadily at the development of our understanding of Jesus and his work and then using that understanding to give us the potential for action on his behalf. Paul explained what he was doing when he said, “But whatever were gains to me I now consider loss for the sake of Christ. What is more, I consider everything a loss because of the surpassing worth of knowing Christ Jesus my Lord, for whose sake I have lost all things. I consider them garbage, that I may gain Christ and be found in him, not having a righteousness of my own that comes from the law, but that which is through faith in Christ—the righteousness that comes from God on the basis of faith. I want to know Christ—yes, to know the power of his resurrection and participation in his sufferings, becoming like him in his death, and so, somehow, attaining to the resurrection from the dead.” (Philippians 3: 7 – 11). The two roads that we should be on, the human-to-human road of love and the human to God road of love are neither of then easy. For the seventh and last time Jesus defines himself with an I AM ‘something’ statement, where this time the ‘something’ is a vine tree. In fact he does it twice, each time using the image of a vine tree to explain and develop an idea, as he has done on each occasion he has used this I AM construction. On the first occasion he says ‘I am the true vine’ and goes on to use the image to explain his relationship with God the Father. The second time he says ‘I am the vine’ and uses the image to explain his relationship to his disciples and, of course, through them to us. In a way it seems to be a bit in the wrong order. If we read 15: 5 first we have the scene set. We are the branches, forming part of the complete tree, which is not just Jesus but is Jesus and his people. It is a many years since, for the first and only time, we walked through a vineyard and saw the vines. You may be much more familiar with what they look like. Forgive me, please, if I get some details a bit wrong! It was immediately obvious that it was not the trees who determined what shape they would be but the owner of the field. Each of them had clearly been heavily pruned to the exact shape that the owner required. They had all been carefully pruned so that they would each get a maximum exposure to the sun so that the grapes might be as good as possible. This is the picture that Jesus used. The owner is God the Father, using a very old image that, for instance, Isaiah used when he wrote his 5:1–7, saying in verse 7 that the LORD Almighty is the owner and the ancient people of Israel and Judah were the vines. In Isaiah’s vision the people were so bad that they had to be destroyed, completely. Jesus knows there is a future for all the new people of God if they walk well with the Lord so he only talks of them being pruned, so that they will develop in full view of the sun, or rather Son. It seems to me a pity that the newer translations into English have changed from the old word ‘abide’ in favour of ‘remain’. A thing may remain. It is quite correct to say that a book remains on a shelf but we would never say that a book abides on the shelf. We reserve the word ‘abide’ for human beings. We may indeed remain in a house, but that only says that we are there. If however we ‘abide’ in the house that says much more - we live in the house; we are resident there. So it is an altogether more powerful word and surely more appropriate for saying something about our relationship to Jesus. What an amazing idea that is! We, you and I, are actually part of Jesus. How we should be careful about everything we do and say, and even think, if we are an integral part of the Lord of Creation. Then in the second part of his use of the image he talks about the necessity that we should bear much fruit. (What exactly he meant by fruit we will consider in our next Gem, our next short study). Of all plants vines are one of the most difficult in which to identify which branch is which and which one goes where. They get intertwined and very closely knit together. It is easy to take a saw and prune most trees, but not a vine. This is an interesting and striking contract with the image that Paul uses later in his letters. He compares the Lord’s people to a human body. Every single part of a human body is clearly identified and Paul uses that to say that some of us will be hands, or eyes or ears - clearly distinguished parts of the body with very different functions (1 Corinthians 12: 15 - 18). Of course, Paul is not wrong in doing that. It suits his purpose which is to encourage the Christians to whom he is writing to develop the different gifts that the Holy Spirit has given to them, distributing the gifts widely and wisely. The purpose of Jesus is different and to be equally heeded. In terms of status we are all on a level. None of us is to consider himself or herself superior to any other believer because of the gifts they are to be given. There is a lovely saying: ‘the ground is level at the foot of the Cross’. We are all branches; all responsible to produce fruit, all equally liable to be pruned if we fail to do so. Each of us has to show the Father’s glory by what we do and say and think. Brothers, sisters, let us be up and doing in the work of our great and gracious Lord and Father. Authority is a dirty word in modern Western culture. Philosophers and other opinion formers seem to have convinced people that anybody claiming any sort of authority over them is only in it for their own good and are trying to establish an undesirable level of control over them and anybody else who falls within their grasp. Perhaps. But then those parts of the world which try to reject that sort of thinking are almost invariably corrupt and corruption stems from a rejection of lawful authority. So we have to conclude that mankind always needs authority, in the form of laws and lawful government, and always wants to reject it. The disciples, and particularly the apostles had lived with matchless authority as they had walked and lived with Jesus as their Master and Teacher. We too, if we have set out to follow Jesus have accepted that his teaching will be the prime authority over us. The big question before those original disciples and now before us is: what did Jesus say about continuing authority after he left this earth? The answer is clear: the Holy Spirit would replace him. What is a great deal less clear is how that authority, coming from an invisible source, is to be conveyed to the people of God. He said: “the Advocate, the Holy Spirit, whom the Father will send in my name, will teach you all things and will remind you of everything I have said to you.” And, in the chapter 16, “when he, the Spirit of truth, comes, he will guide you into all the truth. He will not speak on his own; he will speak only what he hears, and he will tell you what is yet to come. He will glorify me because it is from me that he will receive what he will make known to you.” Fine – but how were they to hear what he said? Similarly we read about ‘walking in step with the Spirit’ but have the same problem. How do we walk in step with someone who is invisible? Most of the answer is in this wonderful book – the Bible. 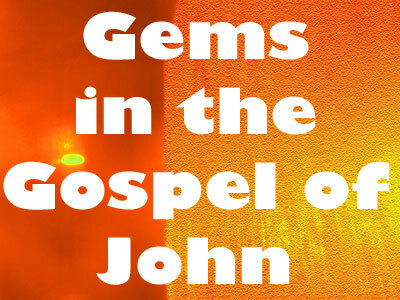 John started his gospel by saying that Jesus is the Word. Teaching, in the sense in which Jesus taught, is always about words. It is not about drawing pretty pictures, or making things as primary school children will do. It is not about excitement or floods of emotion, as many people seem to think these days. It is not, dare I add, about the things we see and hear on our electronic devices these days. Knowing what we should do as Christian believers is about words, which is tough for those who cannot read and can only listen to those who can. I was amazed and shocked in Pakistan that when I asked a village pastor whether they taught their illiterate people to learn scripture by heart the answer was that they didn’t. They certainly should have done. The function of the Spirit is to teach the things that Jesus had taught. But Jesus said more than that – he added an AND. He also said that “ and he, the Holy Spirit, will remind you of everything that I have said to you”. What he most probably meant is that we have to not only learn the things that he taught but interpret them, and apply, them to our very different cultures. That is easy for me to write down and say but very difficult to put into practice. In our church we sing next to nothing but the latest songs and use a 5 year old translation of the Bible. A church 2 miles away boast that they only sing the Psalms, at least 1500 years old, and use a translation of the Bible made 400 years ago. Who is right? We fit into the modern culture; they stick to old, tried and well validated ways. Are we both right? There is material for a good argument there! We do not read that Jesus taught people to speak in tongues or fall over when he spoke to them or many of the other things that have come into the modern church. Therefore those who teach such things may not be teaching from the Holy Spirit of God. Since it is clear from the epistles that such things were done in the early church and are now enshrined in our reliable scriptures they are not totally forbidden, but the main emphasis of our practice in the church should always be on the basic teachings of Jesus, our one and only Lord, Master and Teacher. God had a problem! ! ! Jesus was going to die within the week and after his resurrection would return to heaven to support his people. How, then, could the work that he had done so successfully on earth: teaching people how to relate to the Father God, helping them to deepen their spiritual lives, healing the ill, challenging the faithful and generally helping those who need help be carried on? His solution was to widen the range of action of the Holy Spirit. In Old Testament days the Spirit’s activity had been mostly restricted to the leaders of the people; people like Moses, David and Isaiah though there had always been the hope that there would be a general outpouring. Joel had reported that the Lord said, “I will pour out my Spirit on all people. Your sons and daughters will prophesy, your old men will dream dreams, your young men will see visions” (2: 28). Now the Lord was going to make that true. All the Lord’s people would be given the indwelling Holy Spirit whose role would be to replace Jesus in the life of those who had actually known him and to stand in for Jesus in every detail in the life of subsequent disciples. It is that replacement function that John emphasises in his account of what Jesus said. John’s emphasis is different from that of the other New Testament writers who are more concerned with the outward signs of the presence of the Spirit. Neither he nor they are wrong. The two aspects of the truth about the Holy Spirit and what he does in our lives are complementary. We need to always look for both of them. John reports Jesus said, “the Advocate, the Holy Spirit, whom the Father will send in my name, will teach you all things and will remind you of everything I have said to you”. That is the second time Jesus has mentioned the Holy Spirit in this discourse. The first time he called him the Spirit of Truth (14: 16, 17). He will refer to him as the Advocate twice more at 15: 26 and 16: 7. The word translated as Advocate in the NIV and the NRSV must be one of the most difficult words there is to find an English equivalent of the original Greek word which was ‘paraclete’. The previous NIV had ‘Counsellor’; the old King James version had ‘Comforter’; the Message paraphrase has ‘Friend’ and the Good News Bible, the American NASB and the English Standard Version all have ‘Helper’. Probably something like ‘called alongside to help and advise’ would cover all, or most, of the meanings but that is too much of a mouthful to be used as a translation. The most basic meaning is ‘Helper’ but that misses the idea of advisor, or any sort of legal role as the use of ‘Advocate’ and ‘Counsellor’ suggest, which is also present in the Greek word. Which word should we use? Probably the best advice is – all of them. But even then one will miss the idea that is the most dominant in the sentences that contain the word. We have: ‘the Spirit of truth’; ‘will teach you all things and will remind you of everything I have said to you.’; ‘Father—he will testify about me.’; ‘he will prove the world to be in the wrong … ‘ and then these are followed by the statement that when ‘he, the Spirit of truth, comes, he will guide you into all the truth. He will not speak on his own; he will speak only what he hears, and he will tell you what is yet to come. He will glorify me because it is from me that he will receive what he will make known to you.’ All of which refer in some way or another to knowledge and wisdom. You are clearly looking for knowledge about Jesus and the Spirit. Why else would you be looking at this Partakers site? Good on you! Keep it up! We can never learn too much about our Saviour and the whole plan of salvation. Of course learning facts must not be the end of the matter. We must always seek to put them into practice. That is how we shall walk hand-in-hand with Jesus. He will be our teacher. Jesus promises his disciples he will not leave then as orphans. He will come back again. The obvious question is ‘when’. It is not easy to see when he was referring to. Perhaps he was deliberately making this general statement so that we could fill in the details. If so – here goes. The 4 letters RSVP are well known in the English speaking world although they come not from English but from French. They stand for “Repondais S’il Vous Plait” (I can’t get the accents on my keyboard) which means ‘Respond if you please’ or just ‘Please reply’. They often appear at the bottom of a formal invitation to events like a party or a wedding. It has been suggested that we can use these very familiar letters to remind us of the ways in which Jesus will return. R=Resurrection, S=Spirit, V=Visits and P=Parousia. Let’s take them one at a time. R=Resurrection. Jesus was actually speaking to his disciples and this was, of course, before his death and resurrection so it was a very meaningful promise for them. We have to look back to it but it is a no less meaningful moment for us. Everything that we are and have in Jesus stems from that great event. Without it we would be, as Paul said, “most to be pitied”, by which I think he meant that we would have been expending a great deal of energy on something that was not true. S=Spirit. In a very real sense Jesus came back at Pentecost when the Holy Spirit descended on the followers of Jesus gathered in Jerusalem. After all Christ and the Spirit were both parts of the One True God: Father, Son and Holy Spirit. A huge dynamism descended on all those involved that day. They were no longer orphans. They now knew they were adopted members of a great family, which is now world-wide, the greatest and biggest in the world of which we are part. We can think of ourselves as walking in step with the Spirit, or walking in step with Jesus. Make your choice, or consider yourself involved with both, perhaps one in one hand and the other in the other. I leave you to work out which is which side! V=Visits. Again and again Jesus visits us in the events of our lives. He is with us in our great joys and our deepest sorrows. He is with us in the smaller things of life. How aware of that in the day-by-day events of your life will depend on your personality and, perhaps, in how busy you are. In the days when I drove a tractor for a living I was very aware of his continuous presence with me because my mind was scarcely engaged with what I was doing. When I became a teacher with a room full of 14-year olds I was much less conscious of his presence even although I needed it more. But that didn’t matter – I might have lost touch with him from my end of the relationship but I knew, when I could afford to stop and think about it, that he was still strongly in touch with me so the relationship was as strong, or stronger, than ever. Exactly the same goes for you. P=Parousia. Parousia is the Greek word meaning ‘arrival and presence’ which is commonly translated in the New Testament as ‘coming’, usually referring to the Second Coming of Jesus. So, for instance, the word behind 1 Thessalonians 4: 15 - 17 which talks about ‘the coming of the Lord’ is ‘parousia’ and the next verse goes on to talk about ‘the Lord will come down from heaven’ so there can be no possible doubt that this word is being used about the return of our Lord Jesus to this earth of ours. We call this the Second Coming. How exactly it will all work out we shall never know until it happens. Some bold people, whose boldness outstrips their wisdom, will tell you exactly what is going to happen. They have our Lord’s schedule all worked out for him! But they do not all agree, and surely the Spirit does not disagree with himself so they do not have the Spirit teaching them. The only sure things about the Second Coming are that it will catch us all by surprise and confound all our prophecies – just as his first coming did – and exceed all our expectations for exciting wonder and worship. Jesus goes on after his great statement that he is ‘the way, the truth and the life” to say that his disciples will do even greater things than he did, which is a quite astonishing thing to say. We have to ask - did he mean it in terms of quality or of quantity or what? It is easy to see that in most particulars we can indeed do more things that Jesus did because there are so many more of us. About quality we may well be much more doubtful. What Jesus did he listed in Matt 11:5 as “The blind receive sight, the lame walk, those who have leprosy are cleansed, the deaf hear, the dead are raised, and the good news is proclaimed to the poor”. So far as the first four are concerned – yes, we can do more than Jesus did. Modern medicine has replaced miracle working in these cases. As a friend reported that the surgeon said to him as he was about to operate on a very serious wound “with my skill and the Lord’s help we will see what we can do”. We no longer expect that the miraculous will be necessary in most cases. On the comparatively rare occasions when it does occur we should be glad and rejoice. There were a few hospitals in the ancient pre-Christian world but not many and not very effective either. They mostly made things as comfortable as possible for the dying. That was all that they could do. It was the Medieval Christian hospitals and the development of the realisation that it was possible to apply the ideas of scientific thinking to questions of health which started the developments which are so good today in the matters of health. But Jesus did not stop there. The thing he claimed that is obviously questionable today is “raised from the dead”. To a very limited extent doctors may indeed resuscitate those who ought to have died but that is not quite the same thing. Claims are made in some parts of the present day church that people are raised from the dead. Perhaps. Those of us who live in the post-Enlightenment Western part of the world will always be very doubtful of such things. Your reaction to the very suggestion will depends on where you live and what your church culture is. What we must be careful about is not claiming that we have all truth in such matters. We must rejoice in what we can now do by the great advances of modern medicine. We must be careful not to reject any of the good things we now have. Let us rejoice in them. It is our good fortune to live in days when the Kingdom of God is expanding at an unprecedented rate (except for those few unhappy parts of the world where vicious and horribly misguided people are trying to wipe out Christian faith with the bullet and the bomb – they will never succeed). We have indeed been given access to ‘greater things’ than it has ever been the good fortune of any previous generation to have. Let us rejoice and make the maximum use of these great gifts that are ours. Between the three-fold I AM statement and one of the most amazing things Jesus ever said we have his remarkable statement of affinity with the Father in 14:10. He says, “I am in the Father and the Father is in me.” Once again we are back to the sort of statement that Westerners find so difficult because of their individualism. But to much of the rest of the world this is thoroughly understandable, including those parts of the world that try to argue that God has to be just one -arithmetically thinking. The God we worship is both the Father God and Jesus God (Before this chapter of the Gospel is finished we shall see that it also includes God the Holy Spirit, but we will leave him aside for the moment). Undoubtedly the first Christians found that they wanted to worship Jesus and that raised the question of who was he? Following Richard Bauckham – he says we should not worry about what a God was and is but should set about identifying who was and is God. ‘Who’ is more important than ‘what’. Identity is more important than substance and that seems to be a very important argument. There were 2 supreme marks of God in Biblical thinking; 1) he was the Creator and 2) he is the Sovereign over all. Two things, apart from the person called God in the Old Testament, qualify on those criteria. They are the Word of God and the Wisdom of God. The Word of God was very active at the Creation. Everything was created because God ‘said’. Then in Psalm 104 we read that “How many are your works, Lord! In wisdom you made them all” and there are many similar statements in the book of Proverbs. Both Word and Wisdom were present at the Creation and were therefore part of God and greater than any angel or anything else. When Paul wanted to talk about both God and Jesus he said something really astonishing in 1 Corinthians 8: 6. He said, “there is but one God, the Father, from whom all things came and for whom we live; and there is but one Lord, Jesus Christ, through whom all things came and through whom we live”. If we strip out the sub-clauses we have ‘there is but one God, the Father; and there is but one Lord, Jesus Christ.” Every devout Jew said the Shema drawn from Deuteronomy 6: 4 “The Lord our God, the Lord is one.” twice a day to emphasize to themselves that there was only one God. Paul, a thoroughly orthodox Jew, has modified the Shema to include Jesus. He said, “there is one God, the Father; and there is one Lord, Jesus Christ”. There could be no clearer statement of how Jesus is included in the Godhead. There is one God whose name is ‘the Father, the Son and the Holy Spirit. One final thing we need to note. What does all this mean in terms of what God is like? Amazingly, astonishingly, it means that God the Father is and was a God who was prepared to stoop to wash the disciples feet, to be displayed before all the world hanging on a Cross, and to die for his people, for us! This is the sort of God we have – WOW!